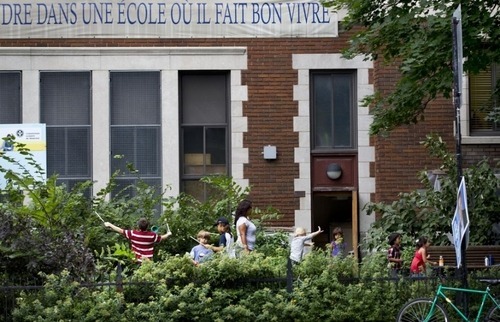 The Saint-Pierre-Claver school is located in the Plateau-Mont-Royal at the intersection of two major streets. A citizen assembly aiming to sensitize drivers to the security of the children attending the Saint-Pierre-Claver school, located at the intersection of two major arteries in the Plateau-Mont-Royal, ended unexpectedly Thursday morning when the police intervened by virtue of municipal bylaw P-6. The assembly, that was attended by several elected officials, ended abruptly at around 8am, coinciding with the beginning of classes. According to Marianne Giguère, a mother who is very involved in matters of security in the vicinity of the school, around six police officers in cars and on bicycles announced to the 80-odd parents and children who were crossing from one corner of the street to the other, all while respecting the street lights, that the demonstration was illegal by virtue of P-6. The intervention was even more surprising to the parents because the community agent assigned to the school had been advised about the awareness action and had already been onsite since 7:30am. “People had begun to cross without impeding traffic, because we wanted it to be a positive and safe demonstration, and the police arrived in their cars, then another two by bicycle. We were told that our demonstration was illegal because we hadn’t provided an itinerary”, says Mrs. Giguère. “We dispersed and it turned out all right in one way, because school was starting and there was already a movement of children who were going inside”. Mrs. Giguère underlines ironically the “discernment” the police officers promised to demonstrate, especially by stating that they would not intervene nor demand an itinerary in cases of celebratory demonstrations following hockey games, for example. “That discernment wasn’t present this morning”, she remarked.